The archipelago of the Surin Islands is about 60 km from the mainland and consists of five islands, the two main inhabited islands Ko Surin Nuea (North Island) and Ko Surin Tai (South Island), as well as the three smaller islands Ko Satok, Ko Pachumba and Ko Torinla and Hin rock Rap. The Mu-Ko-Surin National Park covers an area of ​​141.25 km². It includes the Surin Islands and the surrounding sea. The protected areas of about 108 km² or 80% of the area are located in the sea. The park was declared the 29th National Park of Thailand on July 9, 1981. The Mu Koh Surin National Park is known for its unique surrounding marine life for divers and snorkelers. Usually the islands are reached by day trip from the holiday regions Khao Lak or Phuket by organized tour or by liveaboard trip for 4 days or more. 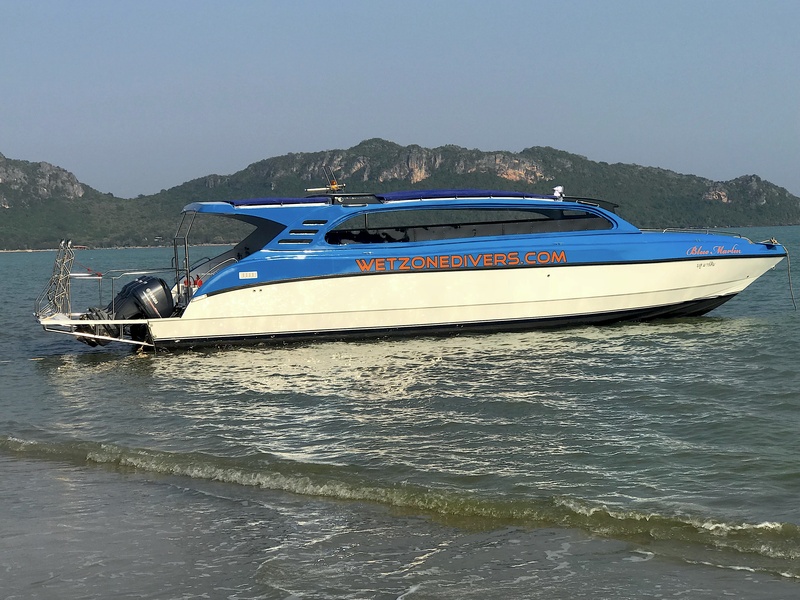 Not many dive safari boats visit the Surin Islands, not because diving at Koh Surin is inferior to other Thai dive destinations, but rather because of its geographic peripheral location. The short 4-day schedule of the more popular Thailand dive safaris does not provide enough time to drive to both the Similans and Surin. The horseshoe-shaped reef discovered by Jacques-Yves Cousteau is known for its purple-colored coral and its diverse marine life ranging from small fish, seahorse and harlequin shrimp to large pelagic species such as whale shark, manta ray, barracuda and grouper. A limestone peak rises from the seabed depth of about 50 m. to the surface at low tide. This place is colonized by something on every square-centimeter: hard corals, soft corals, anemones, sponges, and gorgonians. 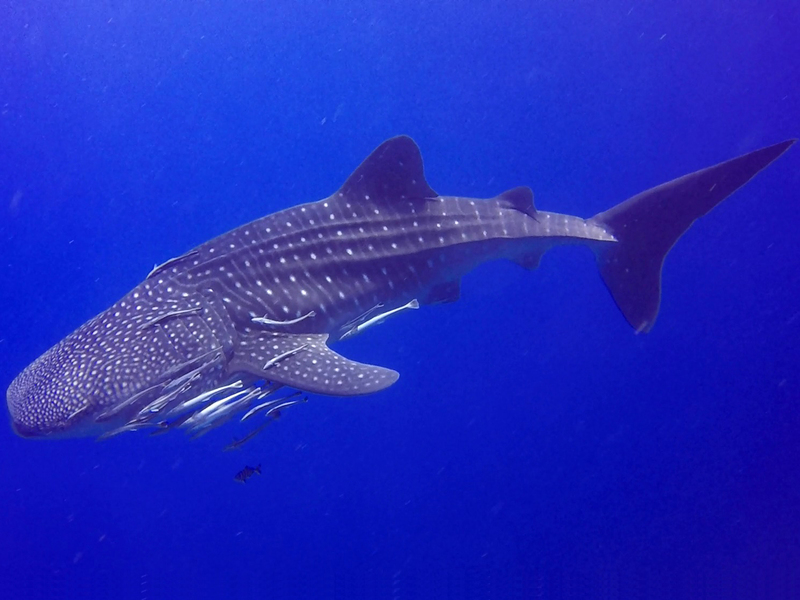 In addition to the possibility of swimming with whale sharks, you can also look forward to seeing manta rays, barracudas and big groupers. All this before you even begin exploring the intriguing smaller creatures lurking in every nook and cranny. Richelieu Rock is considered by many to be one of Thailand’s most iconic dive sites. It is usually hit by dive boats during multi-day cruises as it is too far from the coast to be reached by ordinary dive boats. There are speedboats that go to Richelieu Rock as a day trip. 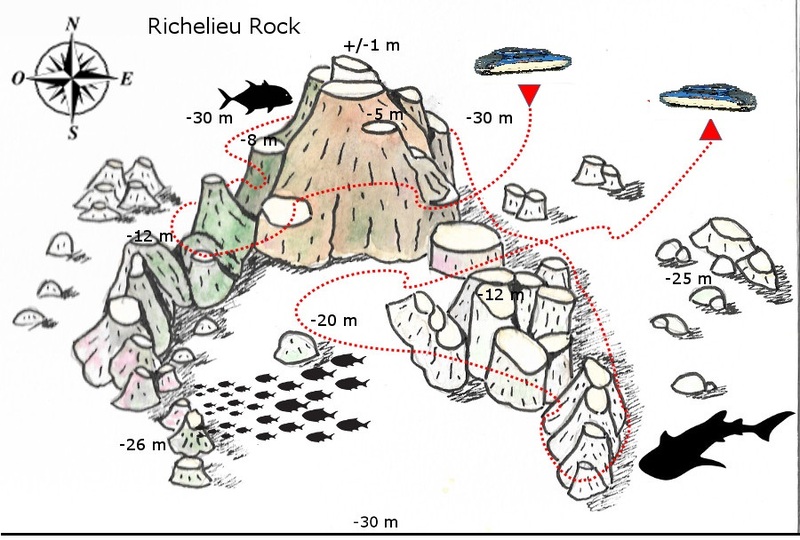 Richelieu Rock, like the entire Surin National Marine Park, is closed every year from 15 May to 15 October.